Dental work in a day that previously took weeks. Now in Fort Myers, CEREC dental restorations is a complete restorative system that allows us to create beautiful and durable all ceramic dental work in just one visit. 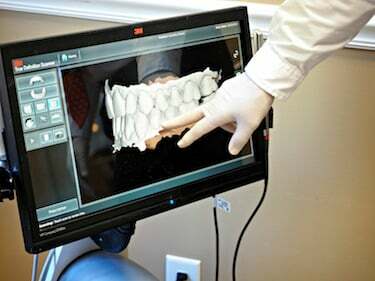 Using 3D imaging to take impressions of your teeth, your restoration is created on the computer screen by The Dental Office of Scott Trettenero DDS. Then it is cut out of a block of industrialized ceramic with our high speed micro milling machine. Not only does the dental procedure save time and energy, it also means that you don’t have to wear temporaries and come back for another appointment to have them removed. CEREC enables us to restore teeth with some of dentistry’s finest materials. Our ceramics are some of the most attractive and durable available. If you live in Fort Myers and you need dental work, consider visiting The Dental Office of Scott Trettenero, DDS for CEREC dental restorations! No messy impressions to make you gag. The most natural looking Fort Myers crowns. Call our dentist, for state-of-the-art Fort Myers crowns. Dental crowns can be done in one appointment with the same precision as laboratory crowns!